The Kansas City Symphony set a new mark in the Guinness Book of World Records for most tubas in concert together. KANSAS CITY, Mo. — The Kansas City Symphony set a new Guinness World Record for most tubas in concert together. 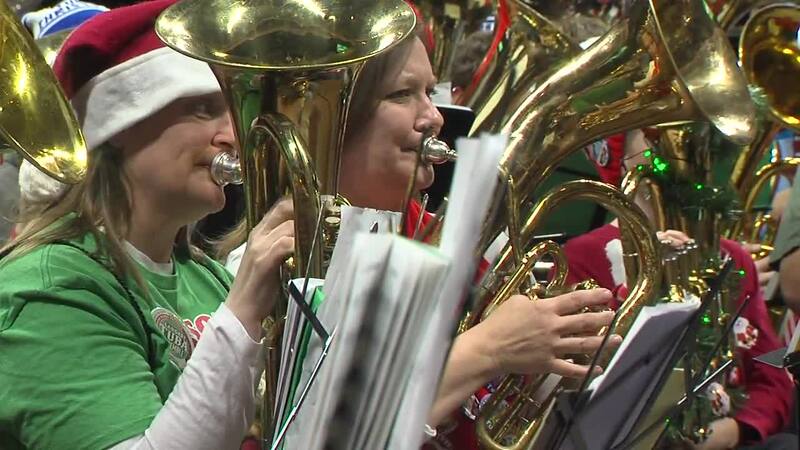 On Friday, 835 musicians played "Silent Night" for five minutes, breaking the previous record of 504 tubas in concert together. The concert was part of the annual TubaChristmas event. "We have mostly amateur musicians who play for the joy of making music. We have players as young as 11 and as old as 86 who are just here today to have a good time and to enjoy making music," said Frank Byrne, the executive director of the KC Symphony. He played his tuba at Friday's concert. To have qualified for the world record, the group had to play together for five continuous minutes. They did so playing "Silent Night" several times. "It is not something you can do casually. You have to have witnesses that are verified by [Guinness]. You have to have stewards that are watching the ensemble perform, you have to have wristbands for a precise count on how many performers are there," Byrne said. The event was free and open to the public. The concert was held at the Municipal Auditorium. TubaChristmas is an annual concert of holiday music played by tubas only. The idea started in the United States in 1974 as a way to honor renowned tuba player William Bell who was born on Christmas Day. The event came to Kansas City in 1981 and the symphony took over organizational operations in 2008. Byrne said in years past they've had more than 700 participants, but no representatives from Guinness to recognize the record.